In celebration of Dia de los Muertos, Sol Treasures will host a "Meet the Artists" event Friday, Nov. 2nd, 3:00 p.m.-7:30 p.m. featuring their latest exhibition "Honoring Our Ancestors, Lost but not Forgotten". Watch a live face & body painting of a Catrina, listen to live music, meet the artists who created the exhibit, view a "personal altar", hear live poetry readings, enjoy refreshments and learn about Dia de los Muertos. 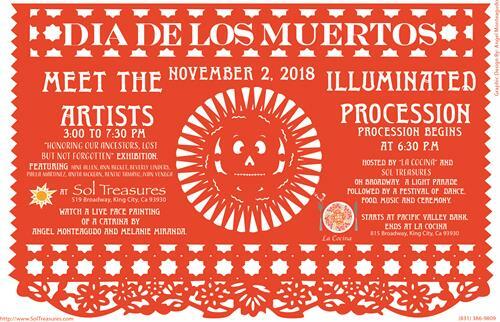 Sol Treasures also invites everyone to participate in or view the Illuminated Procession starting at 6:30 p.m. at Pacific Valley Bank and ending at La Cocina.